Situation: A sandpit in the quarter of Youpwé, an enlarging quarter. 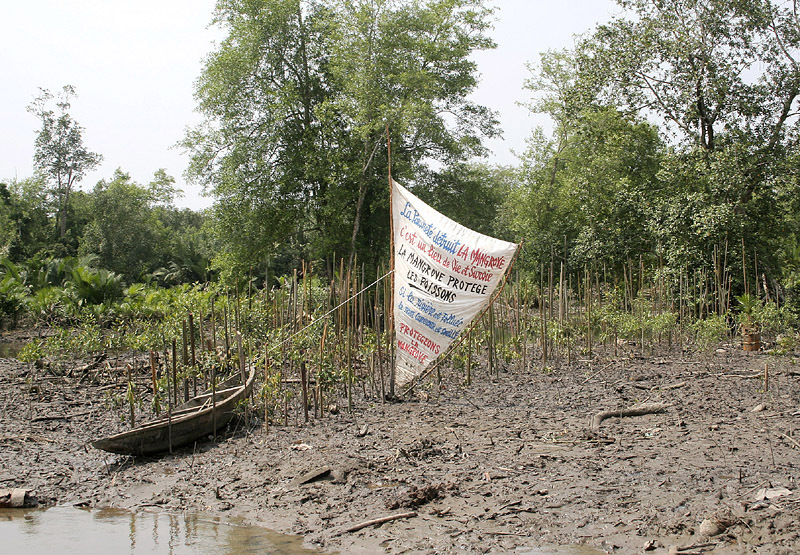 Materials : Pirogue, stakes and wooden poles, ropes and thin cords, cloths, painting acrylic, about 250 stems of leaves of raffia of salt water, about 200 young mangroves, printing impression throw of ink on vinyl, plate of plywood and 2 gibbets. Collaboration : David Séh, Salifou The A Risseng, Mosom A Zitchem Philipp and Mickael Mhi, regular assistants; Patrick Ekole, fisher; Roy Bassiy and Molongo james, assistants of the fisher; George Fodouop, assemblage photographs, computer engineer of the CCF; Koko Komegné, painter. Size : Half a circle of 40 m in the mangrove swamp, height maxi 5 m.
A site in end of pier for the establishment of the panel of pictures of 1,20 m of breadth by 1 m of height and 1,80 m with gibbets. The frame is impressive. They seem to sink in the mangrove swamp when they borrow the way of career. This way becomes thrown, supervised by channels and by a luxuriant vegetation of marsh. In the distance, denser and especially higher, the mangrove swamp blocks us view. They are unable to locate the river. Then the tide confuses the landscape. Waters leave, quickly. Here and there some cans which come to say that we are dealing with a shaded space, in the course of colonization. 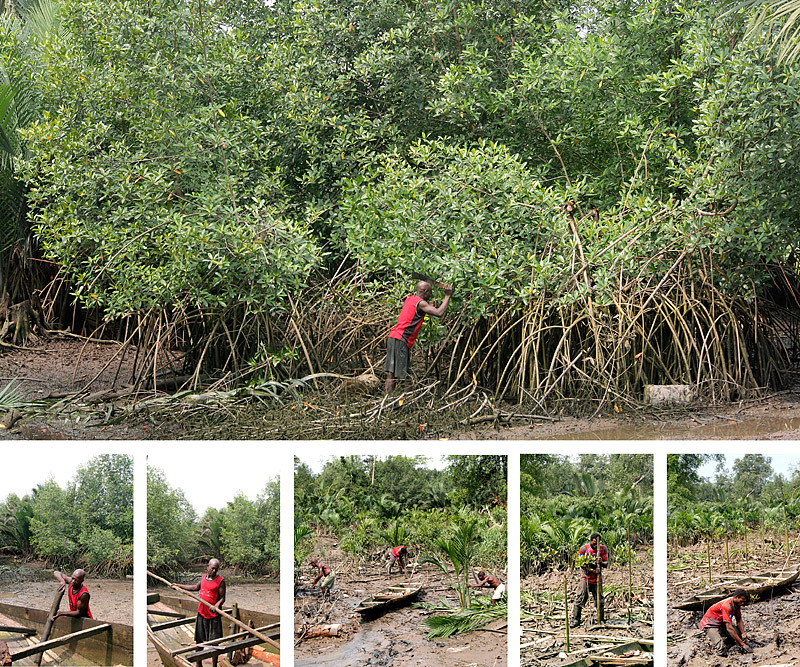 Since then I progressively acquainted with such signs of acculturation of the mangrove swamp. Battle is here unequal so much pressure anthropique is strong. For these reasons, I searched a correlation with inhabitants of the place, a necessary element for the realization of the installation: 'load ' people, implicate them in plan, between borrowing of techniques and discreet homage.